This special installation presents one of Salvador Dalí’s enigmatic and provocative Surrealist paintings from the key period of the 1930s. Lent from the distinguished collection of UNC alum, Julian Robertson (’55), the painting is shown with a related print by Dalí recently acquired by the Ackland. 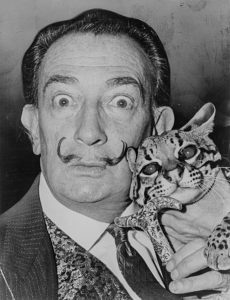 Image: Roger Higgins, World Telegram staff photographer (dates unknown): Salvador Dalí with his pet ocelot, Babou, photograph, 1965. Courtesy of Library of Congress Prints and Photographs Division.